I'm having a super slow start to my week- like I feel like I am behind on EVERYTHING. Anyways, I have a super fun giveaway coming up- stay tuned for more info, I know you all will want this prize!! The kitchen above has nothing to do with this post, but I LOVE it!! I want to move right on in. I love it too! The gray tile is stunning. I'm so behind. My to-do list is growing! Oh well...I LOVE This kitchen too!!! Sounds like you're describing my life. It never stops. Some days I wonder how I manage to keep children alive. And i love the kitchen!! What a beautiful kitchen! Love the tile. I always feel that way, in fact, I think I feel productive about 3 times a year...but oh what a feeling that is! :) Adore this kitchen too! gorgeous...sending better tuesday vibes your way! I pretty much live in a constant state of feeling behind! 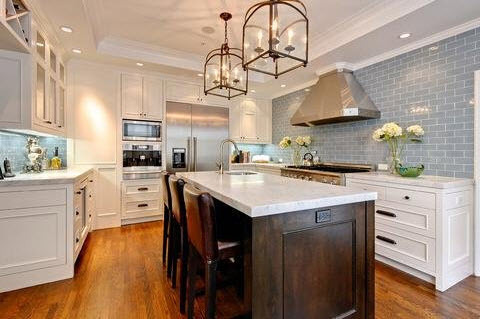 Pretty kitchen-love the lantern style lighting. I'd be happy there even on a monday! I am RIGHT there with you. I feel like I'm in slow motion! Feel like I can't get ahead of anything lately too....just barely treading water! Just would love more hours in the day!! I did get lots done last week and over the weekend! Love that kitchen, thanks for the picture. Talk about being behind... I was just talking to Erika (blu label bungalow) about being behind on tons of stuff. Then add three active boys to the mix and you might as well for get it! I'll be swampped for weeks! Super behind here too! Behind on blogging, behind on reading blogs, behind on commenting!! I too feel that way sometimes but we'll get over it. That kitchen is gorgeous! If I had a place like that I really would have to learn to cook...sigh.